An automaker's model-year is typically a mixture of brand new, broken-in, and aging cars. Not all model years are created equal. Here's what you selected as the ten greatest single model-year car lineups. What Brand Had The Best One-Year Model Lineup? This is Answers of the Day - a feature where we take the best ten responses from the previous day's Question of the Day and shine it up to show off. It's by you and for you, the Jalopnik readers. Enjoy! Want to see this gallery in one slow-to-load page? Click here. Why It Was Awesome: Those daring young men and their flying machines can't be wrong! In 1970, the Muscle Car Wars were at their peak, and Plymouth was getting its biggest guns out for the party. With cars like the Roadrunner, 'Cuda, GTX, Sport Fury and Superbird, how could you not be a Mopar guy, at least for a minute? Why It Was Awesome: In 1965, Lotus featured three of its most loved cars. The Elan was available in three forms: as a coupe, convertible, and competition model. The Ford Cortina could be had with Lotus bits in it, which made it awesome. And the venerable Seven was still kicking about, making people smile (by choice and because the wind was blowing their mouths open). The mid-60's were great for nearly every British sports car manufacturer, and Lotus was certainly no exception. Why It Was Awesome: 1987 was the last year for the original CRX, which by that point had already started creating its legend as a small, lightweight sports coupe that was almost endlessly modifiable. The Civic was in its third generation, and the Si had been introduced on the hatchback a year earlier. The Accord and Prelude were still going strong, and Honda had yet to introduce any trucks to its North American sales. The cars that were available sold like hotcakes with little-to-no dealer incentives needed. This is why people love Honda. Why It Was Awesome: 1991 was the high water mark for the Swedish bricks we all love. Just a year before slightly curvier models would infiltrate the ranks, and the last year of a completely rear-wheel drive lineup. The 240 still had two years to go (and gained a much-needed A/C replacement) and the 780 coupe was still around. It also marked the introduction of the 940. Why It Was Awesome: 1968 is quite possibly the most golden period of Jaguar history. The E-Type was in the last year of Series 1 trim, before it began to lose its looks and gain weight. It could be had in coupe, convertible, and slightly ungainly 2+2 form. Jaguar also had large sedans in the massive 420G and slightly more manageable XJ6, new for that year. Unfortunately, 1968 was also the first year of British Leyland ownership, so the bright light of coolness was about to get a whole lot dimmer. Why It Was Awesome: It must've been good to be a part of Pontiac in 1965: Motor Trend just awarded your entire division their Car of The Year award, the GTO was just taking off and becoming a star, the Tempest was holding the mid-size market spot, and the Bonneville and Star Chief were the big car offerings. The whole Pontiac line had been restyled for 1965, and all cars now featured their signature Coke-bottle curves. Why It Was Awesome: The E30 M3 is a seriously cool car. The E28 M5 and E24 M6 were no slouches either. The E32 7-Series was still massively massive, and the Z1 was just neat. 1988 was still before all of the electrical nannies and computer gremlins came and corrupted BMW, and before they were touting themselves as the Ultimate Driving Machine. There was no hype, and little complication between your right foot and fun. Why It Was Awesome: World, say hello to the 240Z. 240Z, say hello to the rest of your family. There's the C-10 GT-R, 2000 convertible, and the 510, in all its various shapes and sizes. For a company that had arrived on American shores only a decade before, Datsun was making major strides towards its place in history. 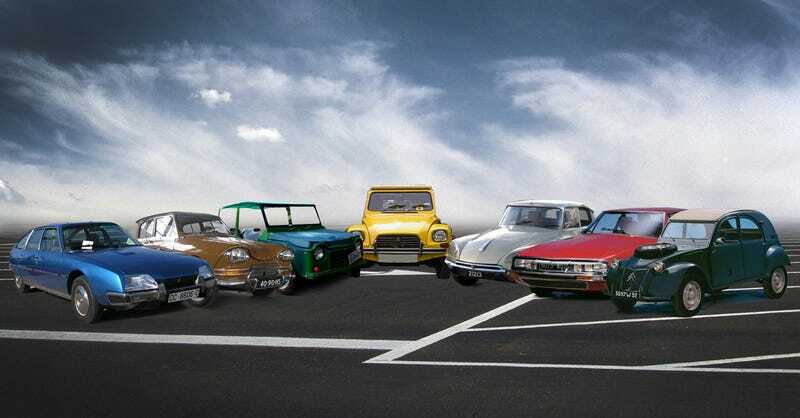 Why It Was Awesome: The 2CV was still being made, and in large numbers, the DS was still one of the coolest things to come from France since Brie cheese, the SM had just won 3rd place in the European Car of the Year standings, failing to nab first because the GS was already there! There was also the Ami, which looked like nothing else, before or since. Why It Was Awesome: 250 GTO. 250 SWB. 250 California. 250 Lusso. 250 GTE All these cars had engines that were essentially the same, and yet they are all different interpretations of the word "beautiful." Ferrari had a good thing in that engine, and ran with it. Sure, there might have been other cars made that year, but when the 250 line is as good as it was, who needs anything else?